To date we have had less than 700mm of rain for the year, which for lowland rainforest, in the wet season, is extraordinarily low. We normally would have had close to 2 metres of rain. It has been hot and humid with isolated thunderstorms - some of which have been spectacular. Trees are flowering, thinking the 'wet' is over, and birds (like the Rainbow Bee-eater) are returning early - it is a little crazy. 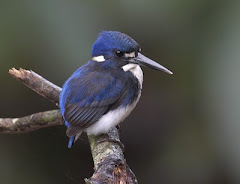 A great time for birding locally though, with a lot of activity as the Buff-breasted Paradise Kingfishers feed their fledglings. This photo is of a young stray a few years ago who came for worms off the verandah. Sweet thing! Good numbers of Black Bittern on the Daintree River and a family of Great-billed Heron near the bywash. Hard-head, Wandering Whistling-Ducks, returning Egrets, Black-necked Stork and Black-fronted Dotterel on the river banks. Lots of rainforest figs in fruit at the moment, so excellent for Double-eyed Fig-Parrot, Channel-billed Cuckoo, Eastern Koel, figbirds, starlings etc. Dollarbird hawking in the streets of Daintree. 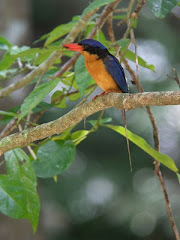 Little Kingfisher and Azure Kingfisher in local waterways. Despite being rather uncomfortable conditions, it is a great time for birding in Daintree.